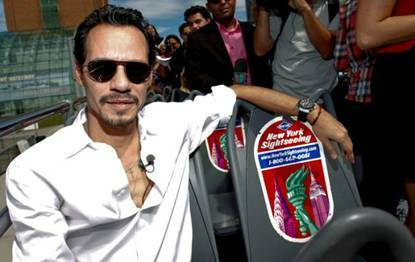 Gray Line New York, New York City’s premier double-decker bus and motorcoach tourism company, honored singer-songwriter, actor, producer and New York icon, Marc Anthony as the newest “Ride of Fame” dedicatee at Pier 78 today. The event was a ribbon-cutting ceremony where Anthony unveiled his own Gray Line New York bus with his likeness on the front of the vehicle. Mark addressed the crowd with words of gratitude and sentiment, prior to revealing the front of the bus for all to see. Since 1926, Gray Line New York has been a proud staple of the New York City tourism industry, bringing visitors to all the must-see stops in New York City on its signature red double-decker tour buses. Now with its “Ride of Fame” campaign, Gray Line New York is recognizing and honoring leading New Yorkers, whom they identify as exemplary community figures by bestowing a bus in their fleet to each dedicatee.